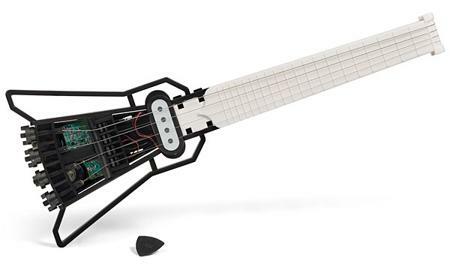 If you ever grew up with the ambition of becoming a rock star, then you might be able to learn to live out that ambition with the $69.99 Mini Electric Guitar Kit. Talk about being a DIY rocker! This particular kit will enable you to build up your very own mini electric guitar, where it sports an integrated speaker, and alternatively, you can still take advantage of the line out feature by using a standard guitar cable to your own amp or pedal among others. Heck, each purchase will even come with its very own guitar pick, now how about that? You can say that Mini Electric Guitar Kit might be one of the more enjoyable kits you have ever put together, considering how this mini guitar itself has a built-in speaker, letting you jam just about anywhere you want to. The thing is, you would do best to practice at home first before showing off your dazzling array of skills to the outside world, unless you want even the homeless folks on the street to throw rotten apples and other pieces of garbage at you. Heck, you can even do up the copper wire yourself with more than 180 revolutions. The circuit board itself comes pre-assembled without any need for soldering. Get ready a pair of AA batteries to get started!